Kara is a great processor. I just cleared a file for her that was perfect. She takes pride in her work, and it shows. File flowed so smoothly. Thank you for a job well done. Was able to call Kim to run a Post closing issue by her. she pointed me in the right direction and let me know how to handle the issue. Team work makes the dream work!! Thanks for all the help. Kimber is an amazing Processor. She has shown to be an exceptional member of our AFN Team. Her dedication, professionalism, and has consistently displayed a high level of customer service. Since I began working with her, I have received countless rave reviews from my borrowers, affiliates, and Agents. She is a SUPER STAR! Kimber…You ROCK! Thank you for taking the time to call and go over the issues on the file. You are awesome! Jon is the nicest guy here and is always in a really good mood. His positive attitude is contagious.Thanks for all you do Jon! Alfredo has processed several of my files of the last few months. The files I have are not always easy and the clients are even harder to deal with but Alfredo has always done a great job on my loan files. I am not sure they would have closed without his help. William is a great team player. He takes on new initiatives without hesitation and with a good attitude. William does a great job of ensuring our initial disclosures are sent timely, while maintaining compliance and process flows. He graciously assist with any task when asked and I am so glad to have him on our team. Scott not only processes our loans, but sometimes finds a better way to get our loans approved. Scott works long hours and is devoted to his job. I know she is sales not branch relations but to me she is. She is the best manager I have ever had. She is always there to help me no matter what, weekends, nights, family events. She is the most support I have ever had. And never complains. Maria is outstanding at communicating, response time, assisting when last second snafus pop up and overall one of the best closers I have worked with at AFN. Mahalo Maria!!! Marie is probably the hardest working person I know! From the moment she sits down to the moment she leaves, she is helping loan officers, pushing files, talking to borrowers when needed, whatever it takes. No task or job is too big or too small for Marie, if it helps move files or helps out loan officers, you can count on Marie to do it. We are lucky to have her as part of the team. I really have to give Luke props this month, always positive, high energy, hard working, ready to do whatever is asked upon him; and lately that’s starting to impact his relationships with his referring partners, resulting in more client referrals, more applications going in the system, and more loans going into escrow. I’m excited to see where Luke will be in 30, 60 and 90 if he continues to push himself to be the best, grow and remain teachable and coachable. Gina is amazing!!! Always helping everyone be the best they can be. Teaching, training, and leading by example are the staples of what make Gina such an amazing resource to the company. Howard worked tirelessly to get a tough transaction done for one my local borrowers. She is a single mother with 5 kids and is so grateful! This file had every twist and turn imaginable and Howard worked through all of it very well. Matt is literally my right leg. I appreciate him so much and know that there is no way I could be as productive, supported & confident without him. He goes above and beyond to support me on a daily basis and I am lucky to have him apart of my team. Thank you for all you do Matt!!! Gina is the bones of our team. I’m not sure how we would breathe without her. She is always super responsive, proactive and willing to make the extra effort to problem solve. We are so lucky to have her apart of our team. Caroline is such a huge asset to our branch and our day to day operations couldn’t be as productive without her. She is always on the ball, proactive and never lets anything fall through the cracks. We are lucky to have her on our team! Great person and very efficient at what she does, always communicates and remembers everything we assign. completes tasks quickly. couldn’t function and close loans without her! thank you Morgan! Ashlee made a Motivational Monday post for every week of the year! So happy I have fresh content! Thanks for being the best colleague, always working as a team with me to tackle all of our tasks. You’re so great to work with! Kirstin is so talented! Everything you make is creative and beautiful. Thanks for being you and making AFN look so great with your creative fabulousness! Thanks for keeping me motivated and letting me know when the office is doing squats so I can join in from a far! 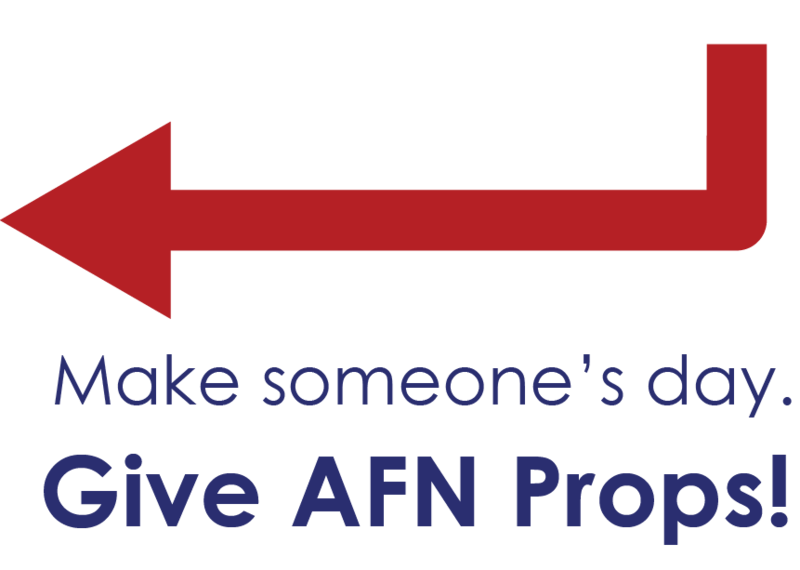 Consistency and Patience as well as the belief in AFN products. Seth is a great asset to the company and his 5 star ratings show his clients feel the same way! Hoa is a huge asset to our operations team. She has an exceptional work ethic and is always willing to assist. Thank you for all you do Hoa! Yvette is so responsive and has a professional, friendly attitude towards any task asked of her. I am still learning, I’m unorganized and I’m all over the place. Still, Wilmagene has always been very patient in answering my questions, providing explanations and giving reassurance. She has come through for me time and again and I want to give Props. Thank you Ashlee for the creative work, and getting me through the planning of the mortgage conference exhibitor booth. There was no way I could have confidently prepared for it without your help and follow through. You’re awesome. Tami goes above and beyond for all the employees in the office and clients. It is more than a transaction for her, she creates relationships with Everyone she comes across. Jessica , Is always so helpful and so knowledgeable and is a pleasure to work with. Andrea is the organizer that keeps us all on our toes! She is a very dedicated to all of our clients and agents. We would not be successful without all of the hard work she does. It definitely does not go unnoticed. Maria is always on point and follows up with title companies. She is a great communicator. I love her! Maria has been terrific to work with. Her positive attitude and approach to my files has really helped my transition to AFN. I just want to say Mica’s hard work does not go unnoticed. I appreciate everything that she does to make our team successful. Great Co-Worker and even better Teammate. No matter what you can always count on River! I’ve said it before but Elvis Mehic is fantastic! He truly cares about delivering for the LOs and delivers on what he promises. Thanks, Elvis! Ariana prepares hundreds of files for closing each month for multiple Funders. I don’t get to see her, however when I interact with her via email she is always very nice, and willing to help. She does an awesome job preparing my loans. Thank you very much!! For doing an amazing job completing all request given in a timely manner and never missing any request! Great Job Jeanie, you’re wonderful and I’m appreciative of your help! Kimber always goes the extra mile! She does whatever is asked of her with a smile. She has a winning personality and the clients love her. Dimaris consistently steps up for all of our LO’s when we are working with Spanish speaking borrowers and has become an asset to our branch. I speak for everyone in thanking her for her efficiency. I’m giving you props because you are on top of your files and help me with communicating with our clients which helps me to continue to generate! I appreciate you my friend!!!! Jessica is always ready to assist with our issues. Thank you for being so understanding with us. What would we do without you Susie. Thank you for always fixing our problems. No one is more dedicated in the company than you!!! Mary even fixes problems in other companies! Thank you for you diligence.